Create fun your way. Choose from 3 different swing frame sizes, swings, and accessories. Customize your 360 Pro Swing Set with an expanding range of swings, set configurations, and accessories. Why Choose the 360 Pro Swing Set? Enjoy years of fun, with two times thicker and 40% wider parts. All it takes is an Upsize Kit and an extra swing to turn your Small frame into a Medium or your Medium frame into a Large. Let your children play with confidence on a solid A-frame fully secured with anchors. We do offer professional installation, so please call us for more information. All Vuly products are sold with a manufacturing warranty, which assures that the item is free of defects in workmanship and materials (“warranty”). 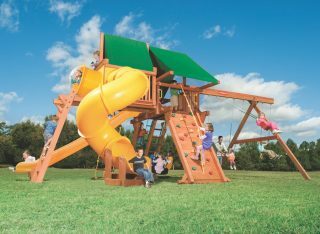 Vuly offers the longest and most extensive warranties in the market on all our swing set models. We provide comprehensive after-sales service, which we believe encourages the customer to purchase from Vuly instead of our competitors. Warranty periods always commence from the date of item dispatch – unless documentation from an authorized third-party installer provides an actual set-up date. Warranty periods on swing sets do not reset for any reason, unless the customer purchases an entirely new product. In this case, that particular product will be covered by its own warranty period. It does not affect – nor will it increase – warranty periods for other purchased items. Replacing any parts that constitute a trampoline or swing set do not change the original warranty period of that product. For more information, click here. 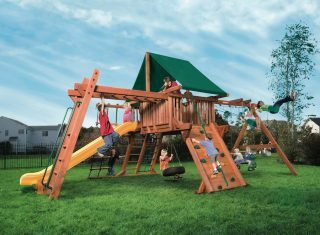 Vuly offers half-price replacement parts to all customers on core components of their swing set purchase – for the lifetime of the product – through the Half-Price Parts for Life program. This program is subject to change at any time, and it is only available to customers who have purchased either through an authorized reseller or directly through Vuly. The program does not extend to individual Swings (which are customizable, and therefore not ‘core components’), accessories or Shade Cover. Are you looking for a deeply mark downed Vuly 360 Pro Swing Set? View our FLOOR MODEL DISPLAY page.